Legend tells that Vittoria, a young noble, converted to Christianity under the Emperor Decius, in the 250 d. C. In those days, a horrible dragon, was spreading death among the population of the country. Vittoria was able to drive it away with the help of her great faith; for this event, all the population of Monteleone Sabino converted. 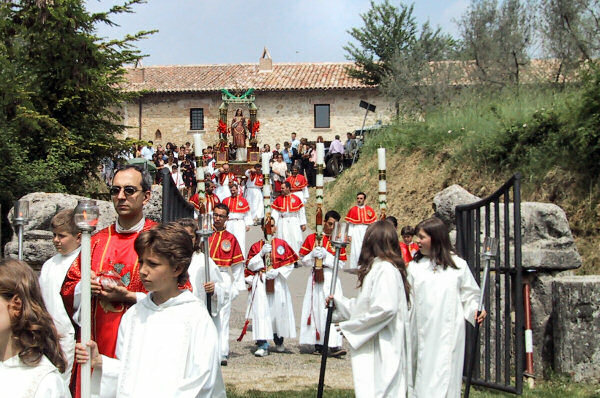 Since then Santa Vittoria is celebrated with great animation in the village, all the residents and people from neighboring village partecipate. Three-day festival with music, processions, and fireworks, creating a strong sense of Christendom and comunity. That festivity is strongly felt from people of Monteleone Sabino, who are all involved in the success of this feast.